This afternoon I’ve been working on the coin mechanism for my Mame arcade machine. On my Phoenix cabinet, the coin mechanism is all mechanical. As the coin travels through the mechanism, it rolls past and pushes a metal bar which in turn is connected to switch that registers a credit. 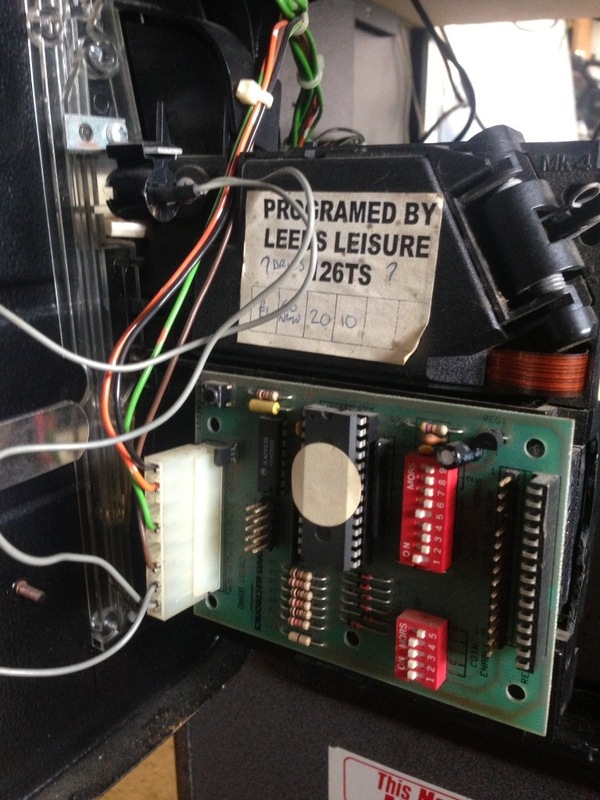 As the switch is nothing more than a standard microswitch, it was really easy to simply connect this to the coin terminals on my ipac to allow for it to work in Mame. However, moving over to this second cabinet, the coin mechanism is an all electronic affair and at fIrst, I didn’t think I could do anything with it…other that fabricate the same sort of metal bar/switch setup at the exit of the coin chute. As always, the Internet is full of useful tips and after finding videos and documentation for this type of coin door, I thought I’d have a go at wiring this to my PC. Mars MS coin mech….I’m not sure if this is a model 111 or 102 though. The control board requires a 12v feed therefore i’ll supply this via my PC’s 12v line taken from one of the spare Molex HDD power sockets. To make it easy when disconnect the coin mech, say for example If I need to bring the PC into the house, I’m going to use a spare 4-pin molex to SATA extension cable I have in my spares. The SATA end won’t be needed though, so this gets the snip. I’ve taken the the 12v and ground feed from the coin mech and attached it to the PC cable via a simple termination block. I’ve also taken the two wires from the credit terminals and wired the positive to the ‘coin’ input on my IPAC and the other to the IPAC ground wiring loom. Originally I had the coin button wired to the Player Two Start button on the Control Panel, but I’ve now returned it to it’s proper function – Two Player Start. Should I need to bypass the coin door, in the event of being caught short of coins, I’ve found a handy IPAC shortcut sequence in Mame to simulate a coin insert – Basically you hold down one player start button & press fire button number 1….man, you’ve gotta love the shift key functions on these IPAC’s! All good to go for testing and so I thought I’d make a quick video as I went along. I’m quite pleased with how it turned out and will have to experiment more with the DIP switches to see what they other settings do. Certain coins that are shiny new don’t seem to work as well as older coins, maybe the reflection messes around with the coin validator? Next I want to remove both of the doors, disconnect the mechanism, chute and locks, give them a rub down to get rid of the flaking paint and apply a fresh coat of Hammerite Black paint to make them look all new again. That’s about all I got done this afternoon as I called my older brother and nephew on the phone to see if they fancied popping around to give my cab a play test. My nephew is a modern COD, Xbox PS3, sorta player but he was getting quite into Metal Slug and it was so cool to be playing side by side with my older brother once again, just like we did back in the old days with 2-up classics like Salamander, Double Dragon and Bubble Bobble. This entry was posted in Mame Arcade Machine and tagged arcade, coin door, emulation, MAME, retro gaming. Bookmark the permalink. Hey Alex, if you watch my video it shows what each wire is. I was wiring my coin mech to an ipac, and running the credit board from power from a PC rather than a Jamma setup hence why I’ve used a standard 4 pin pc molex. I’m a bit confused with one bit of info…where do the coins go?! Do they just drop out the bottom of the mech, and sit on the floor of the cab? There’s a little cash box that sits at the bottom of the cab to catch all of the coins (not shown on the vid). I usually leave a stash of coins in there so you get a nice ‘chink’ sound whenever you insert another coin. Have you got yourself a cab too? Lots and lots of fun, from building it to playing with it. Highly recommended. I’m happy cutting up a Molex extention cable, and hooking up the yellow and black wires upto the pins on the coin board, but how do the next 2 wires actually connect to the ipac? I know this is an incredibly stupid question, but my experience in arcade electronics up to this point has been connecting the push buttons to the iPac, using pre-crimped cables. From what I’ve gathered online, I need to connect the second Ground to the iPac, but doing this will send a 12v signal, and potentially fry it? Hey Ty, always happy to help out where I can and hopefully between us we can get your little project completed and you can start to enjoy all that fun you’re most definitely going to be having when it’s finished. First off, before we begin i’m going to make an assumption that you’re already located the 12v and ground wire (or pins) on your coin board that you are going to join to the yellow and black cable on the PC molex? So as far as powering the coin board, you’re happy knowing how to get that bit sorted? Secondly, you mentioned that there’s a second ground wire/pin on the coin board. If so, as you say this needs to be connected to the ground pin on the iPac (you won’t blow the ipac but see below first). Thirdly, have you located the wire/pin on your coin board which will indicate a credit (we’ll call this the credit wire)? i.e the pin that will need to be connected to the ‘coin’ pin on your iPac? If so, then before doing that we’ll need to check something as we don’t want to blow your iPac. On some powered coin boards there’s a possibility that there’s voltage going down the credit wire. Usually this wouldn’t be much but to check, you’ll need to buy a cheap multimeter. Anything under 5v is fine, anything over (which i’d be surprised) and we’ll have to invoke plan B. It would also be worth checking that second ground pin as well, just to be sure it definitely is a ground pin unless you’re 100% confident it is ground. Incidentally, do you know the make/manufacturer of your coin board? That’s a lot of questions but i just want to be sure I’ve understood your setup etc. As far as wiring it up you’ll need a terminal block (I see from the mention of Maplins you’re in the UK?…if so, you can also get these much cheaper from Wilko’s but to be honest they’re only about 50 pence to a pound anyway. Something like this is perfect, although you’ll not need all 12 blocks, only two pairs. They are designed to be be easily cut with a knife or pair of wire cutters. The terminal block is basically a row of connecting blocks. Wires are inserted into the holes in top/bottom and are secured in place by tightening the little screw on each block. The blocks are connected in pairs (top and bottom) so a wire screwed into the bottom left block will only connect to another wire in the top left block…unless you start mucking about with bridges but we don’t need to worry about that. All you need to do is snip of a strip of two block pairs which equates to four holes and four screws. You’ll also need a molex extension cable for your PC – however this is optional. 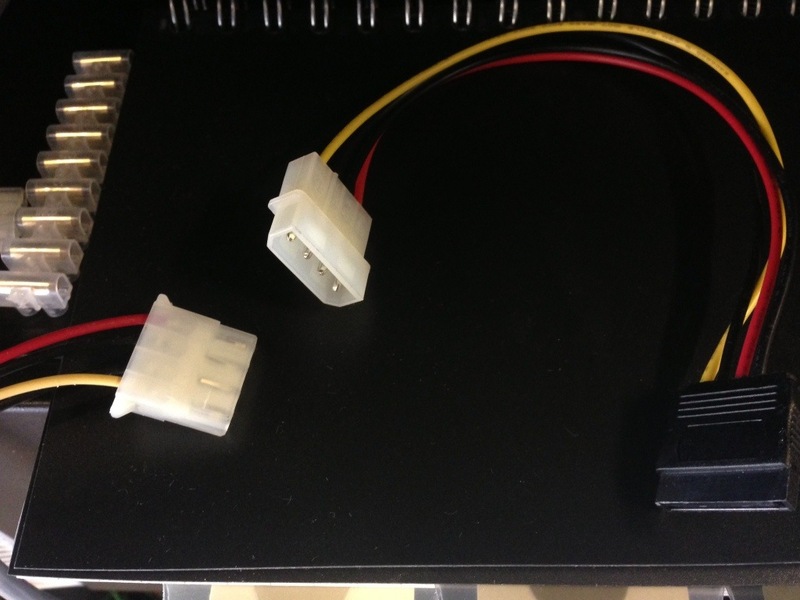 You could snip off one off the spare molex plugs from your PC’s PSU and attach the terminal block directly to it but I found that if I wanted to disconnect my PC from the coin mechanism I’d have have to unscrew the wires from the terminal block. It’s much better to wire a Molex extension to the terminal block and then simply plug/unplug this into the PC PSU. It’s totally up to you though. So as far as wiring is goes – take the yellow cable from your PC molex and screw it into the top left hole on your terminal block (we’ll call this pair 1). Next, take the black cable from your PC molex and screw it into the top right hole on your terminal block (we’ll call this pair 2). Install a cable running from Supply : DGS and screw it into the bottom hole of pair 2. 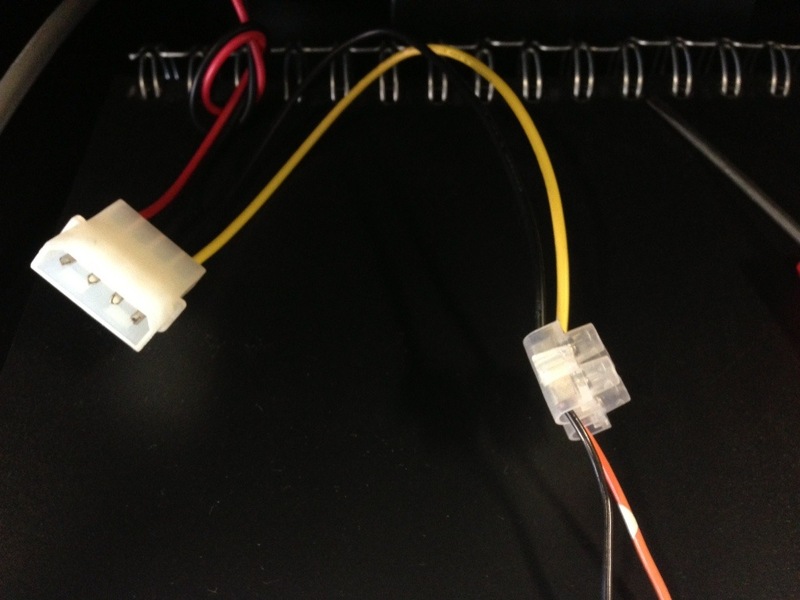 Install a cable running from Supply : 12v and screw it into the bottom hole of pair 1. To summarise – DGS to black cable and 12v to yellow cable. Your coin mech now has power! Switch on the PC and take a reading with the multimeter on Game 0V and Game O/P. If nothing or under 5v then you’re o.k so far. Do the test again but this time insert a coin – you’ll need three hands 🙂 again, if below 5v you’re in luck. Take the the ground cable from your ipac (I’m not sure if you’re using dedicated single cable or a ground wiring loom daisy chained to all the grounds on your controls etc) and wire it Game: 0V. Mission accomplished. At this stage, don’t worry about the lamp or coin counter because here comes the fun bit….testing time. Fire up mame and if you’re using the standard setup for coins (key number 5) try a game and insert a few coins to see what it does. Another test (assuming it is indeed the same coin mech as mine) there’s a black button above the row of pins that will simulate a coin, press this and see what happens. Let me know how you get on after this bit and we’ll take it from there. I managed to write up the marquee light, so I think I’m ready to (not) blow myself up now. Am I measuring for AC or DC voltage on the coin much? Ok, so.. uh.. Now it gets complicated. Took the measurements. The “Game O/P” sends a constant signal of miniscule voltage (0.2v) at all times, and when enough coins are inserted, it cuts the voltage, to tell the iPac that a credit it inserted! Great! I wired it upto the iPac as “Coin 2”, and it all worked. My grounds are daisychained together using a cable that came with the iPac, and then plugged into “Ground 1” on the iPac. I connected the “0v” from the coin mech into “Ground 2” on the iPac. After setting the dipswitches on the coin board, everything is set up so that inserting 10p will send a “6” keystroke. With the mech connected like this, the iPac powers on, and sends a constant keystroke “˥” (That’s a weird extended keyboard thing, not a 1). When any of the joysticks or buttons are pressed, it stops. Also, player 2’s left and right joystick inputs now send the same keystroke. Having disconncted the coin mech from the iPac, everything returns to normal. I’m thinking it might be a problem created by the grounding? Is there any way I could connect it to the daisychain harness, using connecting blocks? I can take photos or record videos, if this makes as little sense to you as it does to me. Sorry this is a hassle, but the “Pints I’ll buy you at any sort of retro convention” count is now upto 3! Hey Ty, well so far it looks like you’re getting somewhere and at least due to the low voltage, you’ll be able to use this particular mech and your iPac/Mame cab. Just this little weird issue to solve. I’m going to have a think on this one mate as I believe after doing a bit of research, your mech is slightly different to mine. Just to clarify, When you say ‘connected 0v from the coin mech into ground 2’ do you mean the 0v pin that’s the credit 0v or the other pin that’s the coin mechs 0v? Oops, forgot to add, this is no hassle at all mate, we’ll figure it out and you’ll be pumping in those 10p’s in no time. The top 2 wires around the power and ground from the PC, which seem to be wired up fine. The bottom 2 are the lamp, which lights up fine, and the remaining 2 (Wires 5 and 6, marked “Meter” aren’t connected to anything. Our coin mechs look identical as far as I can see, and I think the credit boards are universal across all Mars coin mechs of the period? The dipswitches are all in the same place, and the labels all look to be the same. O.k no problem, just trying to visualise your setup and reconfirm the details. Just one more question, the wire connected between game 0v and ground 2, I’m guessing you’ve used just a bit of spare cable? What I’ll do in the morning is check my cab again and just confirm my setup. I think the only difference is that my game 0v is wired using the same daisy chain as my buttons and wired to ground 1. To be honest though, what you’ve done should in theory give the same results. Hey Ty, could you try rewire game 0v to the ground daisy chain. If you pull pack one of the clear plastic covers on one of the spade connectors you should be able to hook your wire in there. I sort of badly twisted it around the spade connector, checked all the inputs, and this is a tentative double thumbs up! I think the best course of action is to play 12 hours of Street Fighter, just to “make absolutely sure” that all the inputs work! In the event you want to bypass putting a coin in, I think the Mame default for a credit is to press the 1-up start button and joystick 1 left (or right, I forget). No need for pintage, happy to help. In the event that you’re going to Revival or Play:expo this year, drop me a note and I’ll say hi. Hey there, sounds good to me. Dont forget that you need to power the coin mech as well. I took the feed from my pc psu for this.